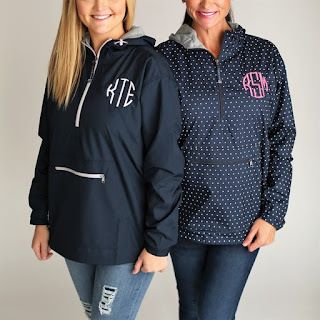 Just ordered one of these Monogram Jersey Lined Pullover | XS-3X $36.99 (Retail $59.99)! BRAND NEW - HIGH QUALITY! Our women's pullover is an updated classic meant to be taken with you wherever you go. Made from 100% Softex Polyester, this wind and water-resistant pullover is lined with a heathered gray lightweight jersey and has a nylon sleeve lining for easy on/off. Hemline in the back is longer than the front - super flattering fit too! Wind and Water ResistantLined with grey jersey - SO comfy! Option to pull the cord tight at bottom of jacket for a more fitted look...OR leave it loose. The option is yours!